Sign Up for a Free Trial of DeCarley Trading Strategy Newsletters! Are Vertical Spreads all they are Cracked up to be? One of the new buzz words in the option industry is the vertical spread. Although they’ve been around for as long as option trading, popularity of the strategy has been on the rise due to historically challenging market volatility and a more sophisticated trading community. Option buyers look to vertical spreads as a means of lowering their cost and risk of a particular trade. Similarly, option sellers seeking to collect premium as an income strategy might choose to implement vertical spreads to limit risk and lower margin. Nonetheless, we believe that in many cases trading vertical spreads might come with more baggage than benefits. Like any other strategy, there is a time and place for vertical spreads, but in my opinion they should not be the staple of a trading portfolio. By definition, a vertical spread is an option strategy in which a trader makes the simultaneous purchase and sale of two options of the same type and expiration dates, but different strike prices. A buyer of the spread would be purchasing the more expensive leg of the spread, which is the option with the strike price closest to the market, and then selling an option with a distant strike price. The seller of the spread would be selling the option with the most value (the one with a strike price in closest proximity to the current futures price), and then purchasing the cheaper option. The term vertical describes the relationship between the option strike prices while inferring the components to the spread share the same underlying contract. A horizontal option spread, on the other hand, would consist of options in the same market and strike prices, but different expiration dates. 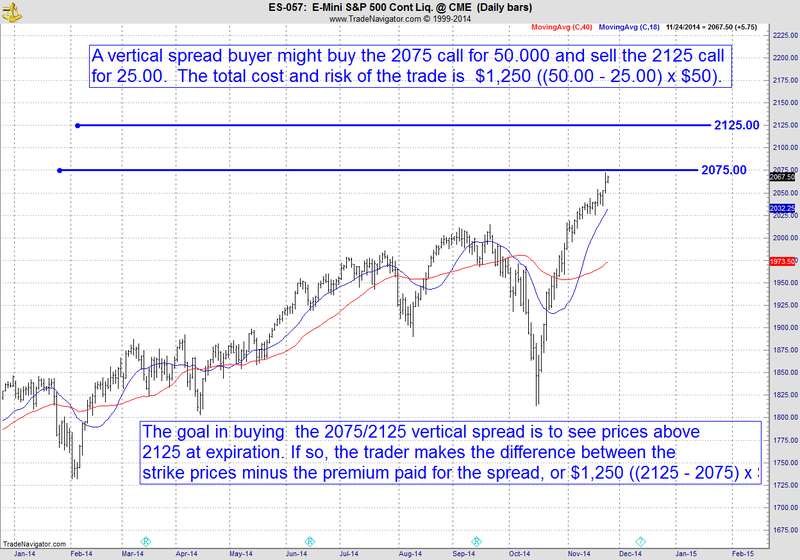 An example of a long vertical spread (often referred to as a bull-call-spread) in the e-mini S&P 500 futures is the purchase of March 2015 2075 call and the sale of an 2125 call. At the end of November 2014, this particular vertical spread could have been bought for 25.00 points in premium, or $1,250 (25 x $50). Simply put, the buyer of the spread is willing to wager $1,250 on the prospects of the S&P 500 being above 2075 at expiration. However, the trader doubts prices will surpass 2125 and, therefore, is willing to reduce the cost of entry and risk by selling a call with a strike price at the noted level for $1,250 (or $25.00 in premium). Had the trader bought the 2075 call outright, the cost would have been about $2,500. The sale of the 2125 call eliminates the profit potential above 2125. At the noted price, the spread is maxed out. Thus, selling a call to pay for a closer-to-the-money-call comes with the opportunity cost of limited profit potential. This is because at expiration, if prices are above 2125 the buyer of the vertical spread is making money on the 2075 call but losing the same amount on the 2125 call to create a “wash”. Charts courtesy of Trade Navigator by Genesis. The seller of the spread is operating under the opposite premise. He believes the price of the S&P will be below 2075 at expiration luring him to sell the 2075 call; he is then willing to purchase insurance to limit the loss should prices exceed 2125. This strategy is known as a bear-call-spread. In contrast to the previous trader who sold the 2125 call to finance the cost of the long 2075 call, the seller of the vertical spread purchases the 2125 call to the detriment of his profit potential in exchange for having peace of mind. Should the price exceed 2125, the vertical spread seller will not suffer additional losses because at expiration, for every point he loses on the short 2075 call, he is making back on the 2125 call. NOTE: There is a substantial risk of loss in trading futures and options. Past performance is not indicative of future results. The information and data contained on DeCarleyTrading.com was obtained from sources considered reliable. Their accuracy or completeness is not guaranteed. Information provided on this website is not to be deemed as an offer or solicitation with respect to the sale or purchase of any securities or commodities. Any decision to purchase or sell as a result of the opinions expressed on DeCarleyTrading.com will be the full responsibility of the person authorizing such transaction.